During our staycation at Shangri-La Hotel, we checked out the Shang Palace (香宫) which specialises in traditional Cantonese cuisine with hints of Shanghainese and Szechuan influence. The main theme for Shang Palace’s interior décor is “Dining in a Chinese Garden” and this is obvious with floral motifs on the red glass ceiling and exquisite hand-painted walls, creating a very classy ambiance. Shang Palace is also known for its Peking Duck (prepared in 2 courses – first: sliced skin with pancake wrap followed by a choice of second course from wok fried, sauteed and deep-fried) at $78 for whole duck – advance order is required. We settled on a Fu Ding Shou Mei set menu ($58++ per person) which came in 7 courses starting with Shang Palace’s three deluxe appetiser delights. The soup dish (see picture below) – Braised shredded onion soup and crab meat is a must try as it combines Western style preparation of the onion soup with Asian elements e.g. crab meat. The next 3 dishes (also featured in the picture below) – Sauteed fresh prawn prepared with fresh “Huai shan” and wolfberries; Steamed sea perch prepared with plum sauce and bean sauce; Braised beancurd prepared with fresh scallops and spinach – provided us with a sampling of the fresh seafood options available at Shang Palace Shangri-La Hotel. 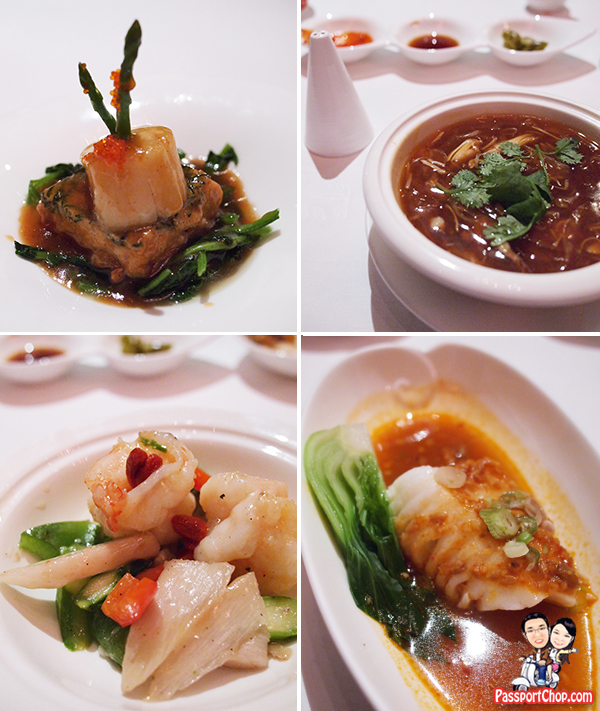 Of the 3, my favorite was the Braised beancurd prepared with fresh scallops and spinach – besides the taste and freshness of the dish, the combination of the beancurd with scallops provided for a unique tasting experience (with both soft – scallop and harder – braised beancurd textures in a dish). By the time we are at our sixth course – Fried minced fish noodles with shredded chicken, we are already quite full – thanks to the succession of yummy small dishes of fresh seafood and vegetables. The 香宫 sweet fancy duets is an interesting mix of mango pudding, pineapple tart and a small cake completed the great dining experience at 香宫 Shang Palace! 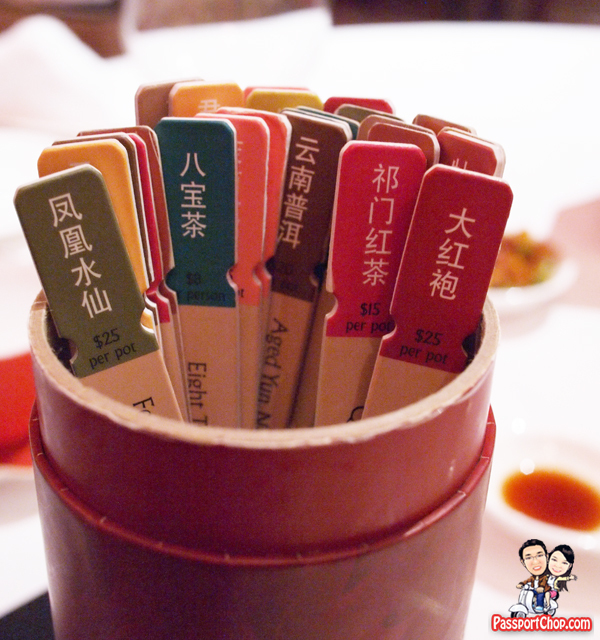 At $58++, I am of the opinion that this Shang Palace Fu Ding Shou Mei set menu is quite value for money! What caught our eye, besides the beautiful decor of the Shang Palace restaurant, was this container of what looked like divine lots – those you see in temples where people shake a similar container until one of the sticks fall out – this stick will be your divine lot and will be interpreted by a fortune-teller. Well – the only thing divine here at Shang Palace is the great selection of tea – as you can see in the picture below – each of the sticks represent a different tea! Not surprising that they have so much to offer for tea considering the 32-page 175-item Shang Palace menu. To make a reservation at Shang Palace, please call (65) 6213 4473. Shang Palace is located at the Lobby Level, Tower Wing, Shangri-La Hotel. The restaurant is open for Lunch at 12noon – 2.30pm (Monday to Friday) and 10.30am – 3pm (Saturday, Sunday and Public Holidays) and for Dinner at 6pm – 10.30pm. Dress Code is Smart Casual. 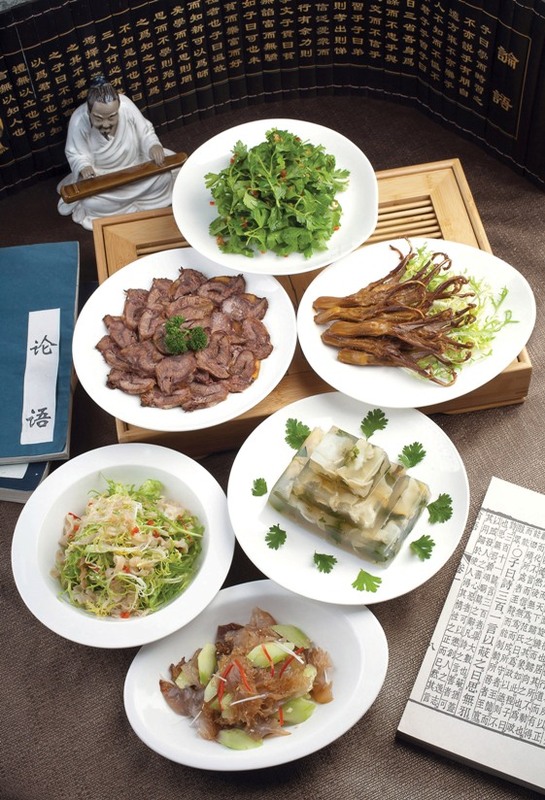 For a very limited time only, you have the opportunity to experience Qufu’s famed Confucius culinary journey from 18 to 24 January 2013 at Shang Palace, Shangri-La Hotel Singapore. Singapore is one of the six Shangri-La Hotels which are part of this promotion. Unique in style, the cuisine of Confucius’ family (kong fu) features creative presentations of skillfully combined ingredients that express the four most important elements in the art of Chinese cooking: colour, aroma, flavour and texture. A team of guest chefs from Shangri-La Hotel, Qufu will recreate the exquisite Kong family cuisine using authentic recipes. Qufu, located in Shandong Province in mainland China, is the birthplace of the famous Chinese philosopher, Confucius. Many of Confucius’ philosophies have spread over time and, under his descendants the Kong family, Qufu cuisine has equally flourished. The delicacies, a combination of Shandong regional Lu methods and Su cuisine from the south of China, are prepared with unsparing attention to ingredients, appearance, taste and shape. 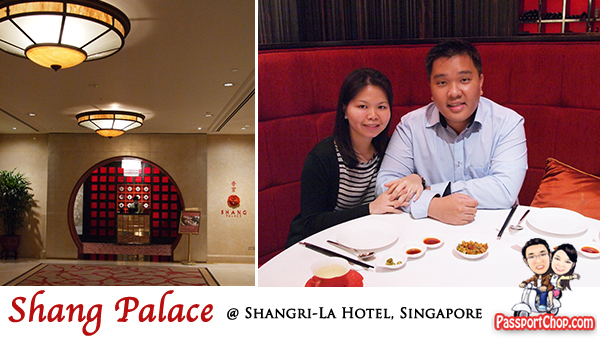 If you are planning to dine at Shang Palace, you can make your reservation below! thank you for such a nice review about this place . So we can be assured of it while next time travelling to same place.